Seven months into all five of the kids being at full day school, I have secured a part time seasonal job! I am going to work as a tour guide at a local historical site. Perks include working mainly school hours (since many of the groups are class trips), getting to work with kids (but not have to wipe noses or rear ends, feed or discipline them), getting to learn more and teach others about local history. Downside? I don't get to dress in period costume every day as I first believed. There will be occasional events where I get to dress like Ma Ingalls but mostly modern clothes. Dang. 5. 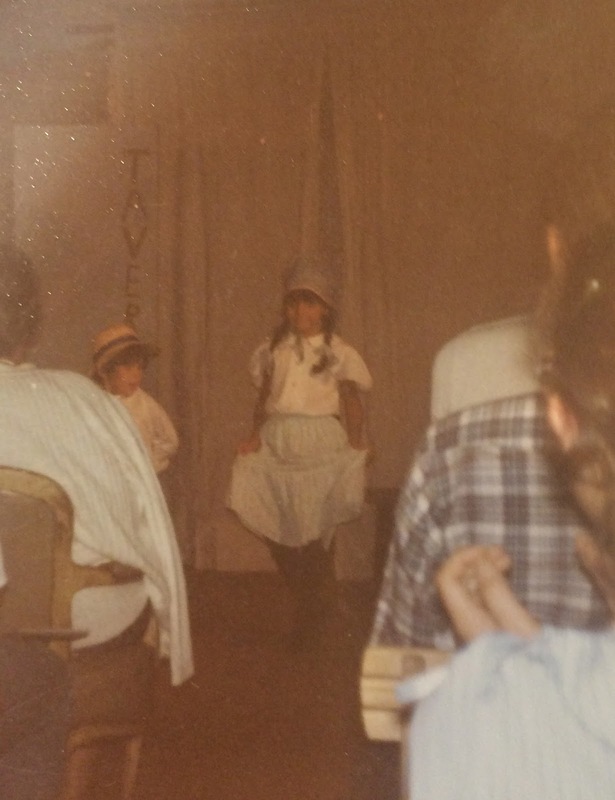 Ask my Mom to dig up pictures from that time in 1982 that I was in a play with my sisters. It was an historical fiction based on this same historical site and was even performed there! I am such a local. Oh hey! She found them! Thanks Mom! *Besides all the ones I have already as Mom to five, babysitter to four, writer, actress, community organizer . . . This job is going to pay in not under-the-table money--I had to fill out a W-4 and everything!